By taking the time to teach our children social skills in the classroom, we are giving them skills that they will use all of their life, whether at home with family, in high school with friends or with coworkers at a job. At Virginia Chance School we focus on educating the whole child which includes a child's social and emotional development. Teaching and implementing The Zones of Regulation is one of many tools that we use to help children learn to identify their feelings and regulate their bodies. Our students also learn strategies to calm themselves such as breathing or removing themselves from the situation when they are in the yellow or red zones. Stephen Glenn's Developing Capable Young People and Jane Nelsen's Positive Discipline teach parents and teachers how to raise children who are confident, resilient, eager to learn, cooperative, compassionate, independent and problem-solvers. As teachers, we take this training every year to ensure that we are using the strategies necessary to help your children become kind, caring, happy, engaged and excited learners. One way to cultivate these skills is to hold class meetings for students to hash out any whole group challenges that the class is facing. Class meetings allow students to share any concerns that they may have or difficulties that they are having in the room. The group works together to find a mutually agreeable solution to each problem. When conflicts arise in groups of 2 to 4 students, we have the children share their thoughts and feelings with each other, and then they work together to come up with a solution that is agreed upon by all parties involved. During these sessions, a teacher acts as the facilitator or mediator, but both of these types of group meetings are student lead. By having meetings, the children feel heard and valued as they share their thoughts and work together to come up with solutions. Another avenue for teaching social skills includes having our very own School Counselor, Bridget Morgan, visit our class and teach lessons. Bridget has helped us think about what it means to be a good friend, as well as, what it means to be a Space Invader and how we can avoid invading a friend's space. Recently Lindsey Jones, an occupational therapist, visited our room and read the book You are a Social Detective, by Marcia Garcia Winner and Pamela Crooke. This book describes how to be a social detective and how to use tools to make a "smart guess" when reading a situation or someone's facial expression. This story tied in nicely with our recent literacy focus of using inferring as a strategy to comprehend stories that we read. 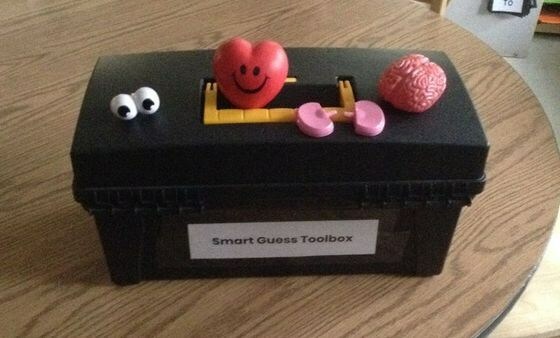 As the children already knew how to infer, we gave them a few new tools for their Smart Guess Toolbox to help them infer how a friend is feeling. These tools included eyes, ears, heart, and brain. To practice this idea of making a smart guess, we showed the children several pictures and had them share what tool they were using to make their inferences about what was occurring in the photo or how the person was feeling. Here's what they shared. "I use my eyes to see she is sick." "I use my heart to know she is sad because I am sad when I am sick." "She has a fever because they are taking her temperature. I used my brain." "He is sad because you said he was crying. I used my ears." "I used my eyes to see tears, so I know he is sad." "I would be sad too if I dropped my ice cream cone-my heart." "You said shouts of joy ringed out. I would use my ears to hear that." "I see with my eyes that they are smiling. They are happy." "I love sledding. I am happy when I sled. I know that because of my brain." We took several opportunities this week to practice our newly learned detective skills. By the end of the week, we became professional, smart guess makers, these new skills allowed us to move on to what happens after you make a smart guess. After inferring what had happened or how the children in the photos were feeling, our students thought about whether or not they should approach and what they might say to that individual. One friend shared that they would say "Can I get you a glass of water? I am always thirsty when I am sick." Another friend replied, "I'll get you another ice cream cone." One of the photos was of a little boy getting his hair cut for the first time. The child in the photo looked very scared. Several friends commented that they would approach and say, "I was scared to the first time I got my hair cut," and "I could hold your hand if that would make you feel better." By taking the time to teach children social skills, we are giving them skills that they will use all of their life, whether at home with family, in high school with friends or with coworkers at a job. Find some photos in books of children showing different facial expressions. Let them share what they learned this week about being social detectives, making smart guesses and using their smart guess tools. Children love to share their learning!